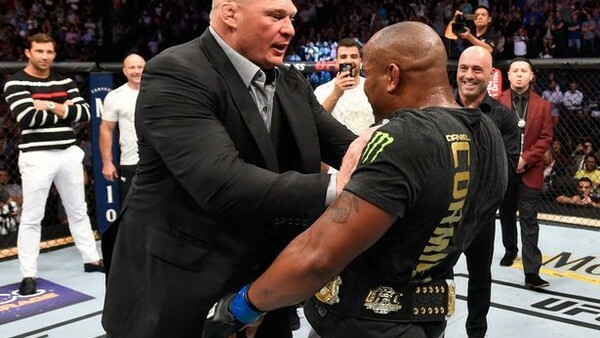 Brock Lesnar, sitting cageside at last night's UFC 226, stormed the Octagon following a challenge from Daniel Cormier, who had been triumphant in the night's main event. Let me tell you something, I walk into this building and watched the heavyweight disasters from the beginning, Ngannou the piece of sh*t, Miocic the piece of sh*t, DC I'm coming for you motherf*cker! Prior to the tussle, UFC Light Heavyweight Champion Cormier demonstrated his incredible skills by knocking out the most successful UFC Heavyweight Champion of all time, Stipe Miocic. In a contest that saw both fighters enjoy dominance during the brief duration of the bout, Cormier managed to land a crisp right hook from a clinch that dropped Miocic before finishing the fight with devastating ground and pound to capture the title. The win sees Cormier become just the fifth fighter in the history of the UFC to win belts in two different weight classes, and he becomes only the second fighter after Conor McGregor to hold two belts consecutively.